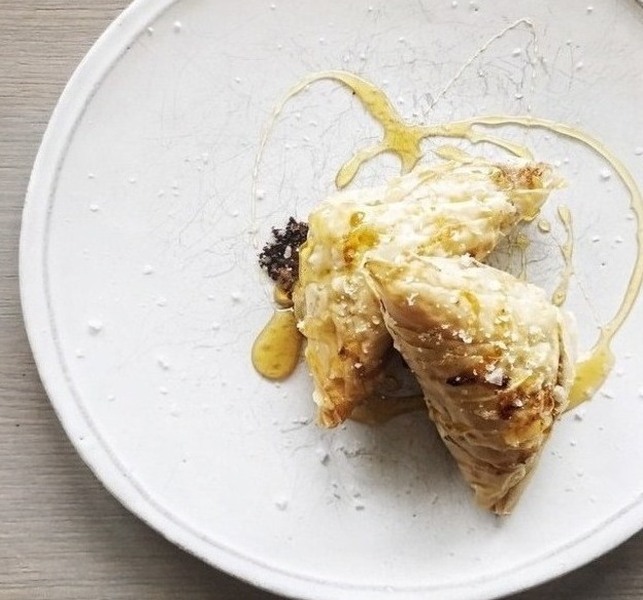 Flaky phyllo wedges stuffed with warm apple compote and melty brie, and topped with salted honey. Recipe by Jodi Moreno of What’s Cooking Good Looking blog. Start by making the apple compote. Place the apples, apple juice, honey, butter, cinnamon, and nutmeg into a medium saucepan over medium heat. Cook until the liquid has evaporated, about 10 minutes, stirring occasionally. Once the liquid has evaporated, lower the heat to low. Add the vinegar, salt, and pepper, then stir and cook for another 5 minutes until apples are very tender. Remove from heat and set aside. To begin to assemble the wedges, prepare a parchment lined baking sheet. Gently unroll the phyllo dough onto the parchment, and cover phyllo sheets with plastic wrap, then a slightly damp towel to prevent them drying out. Have a flat working surface (such as a cutting board), a bowl with olive oil, a brush, and another baking sheet nearby. 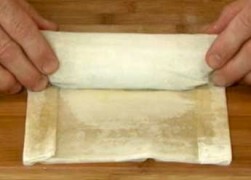 Remove a sheet of the dough and place it onto the flat surface. Brush the sheet with olive oil, and then add another phyllo sheet on top. Brush that sheet with olive oil, and then add one more sheet on top, but do not brush it with olive oil. Slice the sheets, lengthwise, into three equal pieces. Place a spoonful of the apple compote and a thin slice of brie about 1″ from the corner of each strip. Fold the corner of the dough diagonally across to the opposite edge to form a triangle, and continue folding until you have a complete triangle. Brush the outside with olive oil, drizzle generously with some honey, and then sprinkle sea salt on top. Do this entire process two more times until you’ve used all 9 sheets of phyllo. Place the wedges seam side down onto baking sheet about 1″ apart. Bake for 20 minutes until golden brown and serve warm. Triangles can be wrapped in plastic and frozen prior to baking.